Hold down the Vol- and Power buttons. Release the Power button once u-boot reports: key pressed value=0xb. Press the Power three times, u-boot should report: you can unclench the key to update now. It is possible to query the device version at this stage, but reading results in failure. Remove the two screws surrounding the button panel interface. Insert a suitable plastic tool into the seam of the casing next to one of the screw holes. Gently slide the tool towards and around the nearest corner. If the first clip has not been released at this point, twist the tool slowly to pry the casing halves apart. Place the tool on the opposite end of the released clip and proceed by sliding the tool towards the next clip. Continue carefully around the perimeter of the casing until all clips have been released. 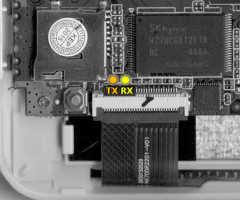 UART TX and RX can be found between the µSD connector, NAND Flash IC, and Touchscreen FPC connector. See the UART howto for further information. 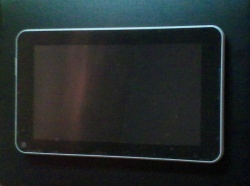 Digma Optima 7.11 TT7041AW (Russia). --The above ROM is working fine. This page was last modified on 23 December 2016, at 10:21.